Tenmar Swiftclaw is an epic Agility creature card. It is part of the Core Set. "This one has been sharpening her claws all day." 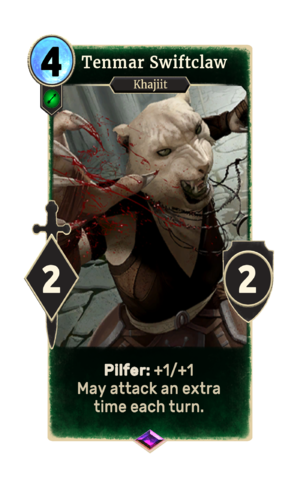 "Khajiit is a five-clawed killer!" This card's pilfer ability applies the Swift Claws card effect. The card is named for the Tenmar Forest. This page was last modified on 15 February 2019, at 14:08.